A traffic jam is a traffic jam. You’ve probably experienced a few yourself. 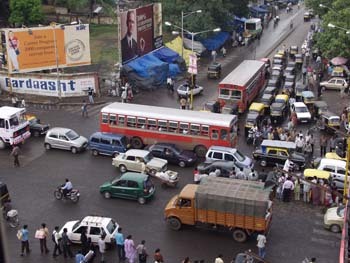 This picture shows a typical intersection in a large Indian city. See all the foot traffic? There’s even a bicyclist in the mix. An even more typical jam would include at least 40% more of everything you see here! If it were a smaller city, you would see far more people, several auto-rickshaws, taxis, and in some of the villages there would even be a few cows wandering about and maybe a bullock cart or two as well. Actually, there are far worse traffic jams, and while we traveled all over the country, we were in a lot of them. 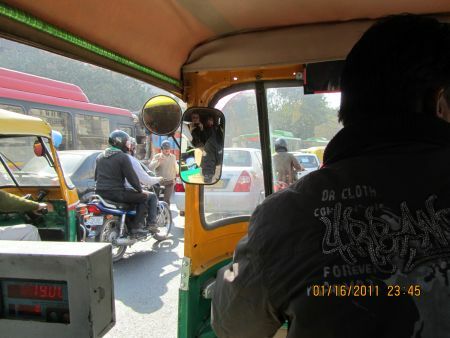 Even on my very first visit to India, I decided I would never, ever drive in India! Even though I’d managed to drive already in New York City and Boston. 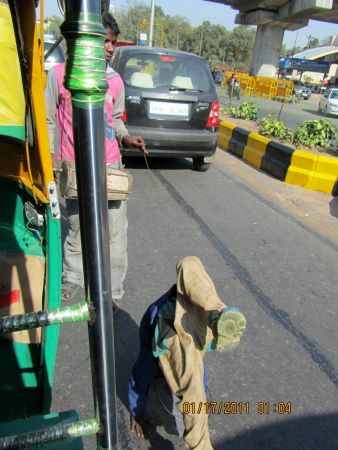 Driving in India is very very different. First of all, there’s the problem of driving on the left side of the road instead of the right. If you dislike making left turns into busy traffic without signal light, that means you’ll hate right turns in India. Had I ever taken the wheel and considering the number of miles we covered during the four weeks there, I reckon I would have killed a hundred people at least, and no telling how many animals and fender benders included. How do you figure out where to go and what to do when you find yourself with free time in an unfamiliar city? Hubby and I consider ourselves seat of the pants type people. That means, we don’t like planning too far ahead, and maintain a see what turns up attitude as we amble about trying to stay out of trouble. 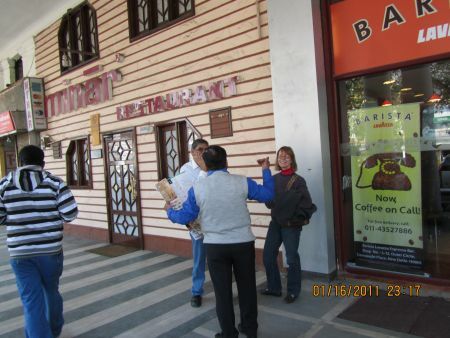 We’re apt to ask locals on the way Where can you get a great cup of coffee? Where’s a good Internet Cafe? Where are the shops with the best prices? What we usually find is people are friendly and helpful when you’re friendly and don’t act threatening and judgmental yourself. Someone directed us to a tourism shop around the corner, and there, when we asked where we might find an internet cafe, we were invited to use the computer in the office upstairs, for free. Afterward, back outside on the street again, a tall man in a black turban gave us his opinion on the best section of Connaught to shop, and where to find the best coffee. Which we did. Then, right outside the coffee shop, where I’d had a Masala tea with milk, we met and struck up a conversation with this man. Turned out he was the owner of coffee shop we’d just left. His name was Babloo. Introductions were made all around. Did I mention how friendly Indians are in India? Well, Hubby told him his nephew in Delhi was Babloo too. (True.) Immediately it was as if that automatically made us honorary members of his own family. Not only did he advise us the best shops to go for the things we were looking for, he rounded up a rickshaw wallah (driver) who wouldn’t take advantage of us, and asked him to take us to all those places. That’s how we met Arvind. An auto-rickshaw is designed somewhat like the old-fashioned hand-pulled cart from the days of the British Raj, except it has an electric motor with a sheet-metal body over an open frame, and a canvas roof with drop-down-sides. There’s a seat in the front of the small cabin for the driver, with seating space in the back for up to three passengers. In some cities, you can still see the occasional bicycle rickshaw that takes a lot of leg muscle to operate. I don’t think I could sit still for a man weighing less than I to pull me about like the Memsahibs of old, and I’d think twice before expecting someone–even if he has big leg muscles–to pedal me, but I’ve always rather liked the motor-driven rickshaw. In some ways it’s like riding a rickety old roller coaster at a state fair, except it feels far more daring–even downright dangerous. This picture will give some idea, hopefully, of what’ it’s like being in the thick of traffic in almost any city in India. If you have a magnifier, you might spot me (the camera too) and ML in the long mirror to the driver’s left. Along the way, when there’s even the smallest pause in traffic, people crowd into the street on foot to cross to the other side of the street, or there will be beggars who tear your heart out come up close enough to touch, vendors with everything from flowers and balloons to snacks if you get hungry beseech you to buy something, and even sometimes–as you see here, there’ll be a child scooting right alongside traffic turning cartwheels while his front man walks slightly ahead of him to watch out for and collect tips. What a way to make a living! While I can show you this small portion to hint what it feels like, I’m sorry I’m unable to let you experience the sound. There’s a horn honking every few seconds, the steady drone of cars and trucks passing overhead on the flyover road above you, people chattering. It would be interesting to know the decibel levels of traffic in Delhi. I didn’t notice my tinnitus when I was there if that tells you something. And the smells. I can’t duplicate the smells, and that–from traffic–is a good thing. In the early 2000’s, India’s government began pushing for conversion of public transport from diesel to compressed natural gas, so the smell has significantly improved, though studies show that while natural gas does eliminate the horrible smell of diesel and cuts down on pollution, it may have a negative impact on climate change. Regardless, the majority of buses and goods transporters (trucks, etc) now run on natural gas. For the rickshaw passenger, natural gas results is a quieter ride. But I kind of missed the phut phut sounds those old diesel-driven motors made. At the end of our shopping day, Arvind kindly agreed to let me take his picture. (I didn’t tell him I might post it for all the world to see, but I hope he wouldn’t mind if he knew.) After several trips together criss-crossing Connaught Circus circle streets, ML and I have become Auntie and Hubby is uncle to Arvind. If I could I would tell Arvind, who gave us all many thrills with his artful driving skills that afternoon, Arvind, if things don’t work out in Delhi, you have a future driving a taxi in New York City. From here, we’ll reverse our Metro tracks back to our hotel on Ring Road–purple line to the yellow line to Moolchand. I remember that someone in the comments several posts back requested lots of pictures of saris. It was near dusk when we arrived back at our hotel, but since it was Monday, the fancy sari shop next door was still open. ML and I had promised ourselves the previous day that we’d check it out as soon as we could. Remember, this is where I almost got in trouble just the afternoon before -taking an unauthorized picture of the storefront, so we cautiously entered. So glad we did. My next post will feature a few of the beautiful saris we saw there, and the bride-to-be we met. Thanks so much, Larry and Crinne! Wonderful, just wonderful and I asked to see the saris. I look forward to the colour and style. Great story and pictures. I felt the same way about traffic in China–would never drive myself and wasn’t too comfortable with other people driving. Needless to say, walking was also an amazing experience. I love the sound-bites as much as the photographs! Oh the sounds of a place. That’s what makes India so special (at least one of the things). Am back from a Smoky Mountain trip and back to catching up on your India adventures. The word “amble” catches your experience so well. No rush to check items off you list, you gently gather every nuance of the experience — all the sensory ones as well as relationships with other people. Will be working my way up to your more recent posts. This one was a treat and I am looking forward to the others!